We are from the Netherlands and we love to travel around in the USA and Canada. We are always busy planning another trip and try to come over as much as possible. Boondocking seems to us an ideal way to keep the budget low, meet new people and we hope to be able to offer our hospitality to boondockers in return when they will travel in our country. My husband loves the outdoors and working out. I love to quilt and buy my fabric in the United States when we are traveling. 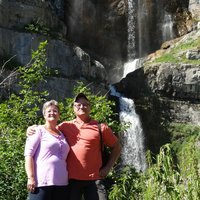 We don't have any experience with boondocking yet but we are planning an RV trip in Canada and the US in 2014 and are looking forward to try it. We would love to have our own RV but we are satisfied too with a rental one while vacationing in the US or Canada.